Preheat the oven to 190C/375F (fan forced). 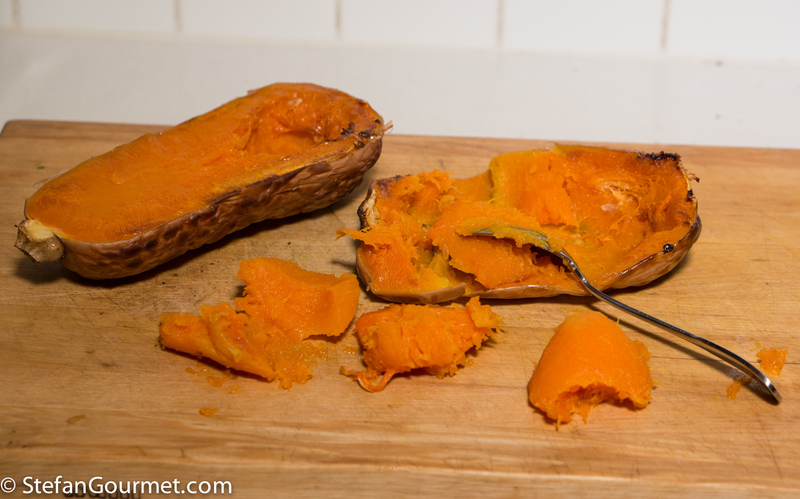 In the mean time, cut the squash in half lengthwise, and scoop out the seeds with a spoon. Bake the squash on a baking sheet with 120 ml (1/2 cup) of water in the oven at 190C/375F until tender, about 45 minutes. Then take it out of the oven to cool. 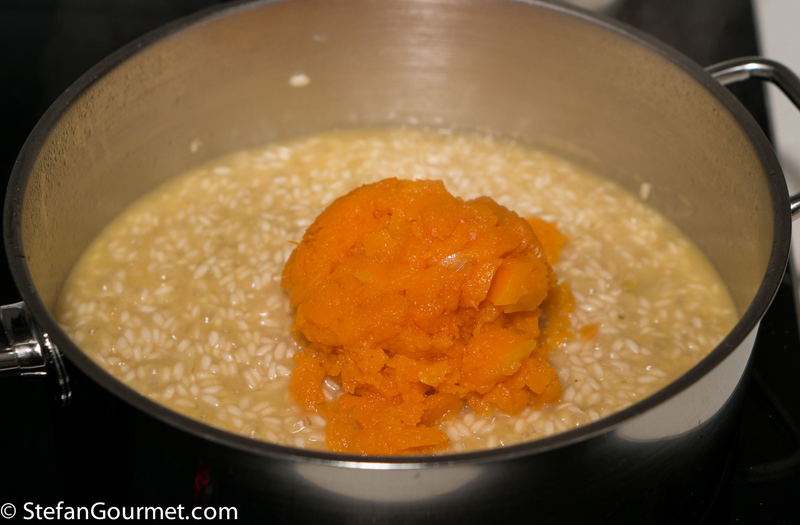 Start with the risotto while the squash is cooling. Heat up 750 ml (3 cups) of vegetable stock in a saucepan and keep it simmering. 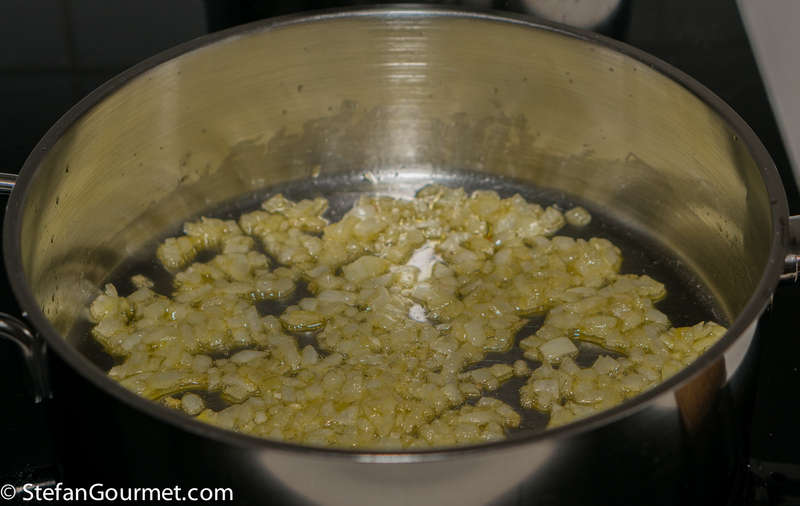 Heat 2 Tbsp of olive oil (or butter) in a wide thick-bottomed pan, and add a small minced onion. Cook over low heat, stirring regularly, until the onion is slightly golden, about 10 minutes. 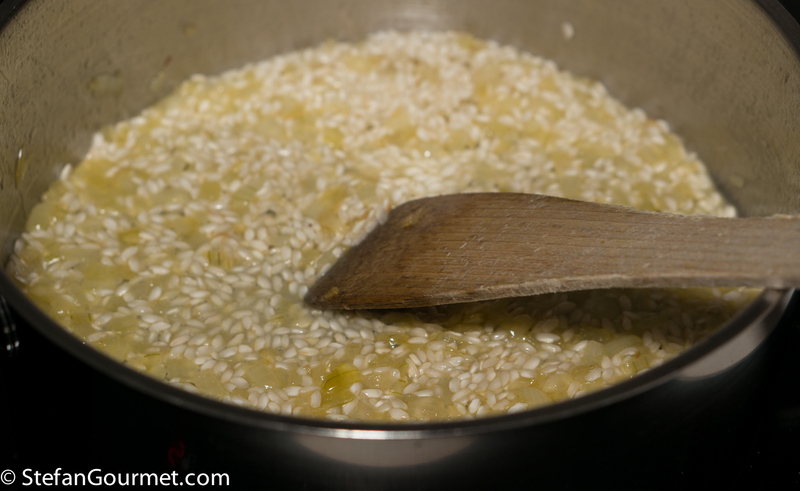 Raise the heat to medium and add 130 grams of risotto rice. 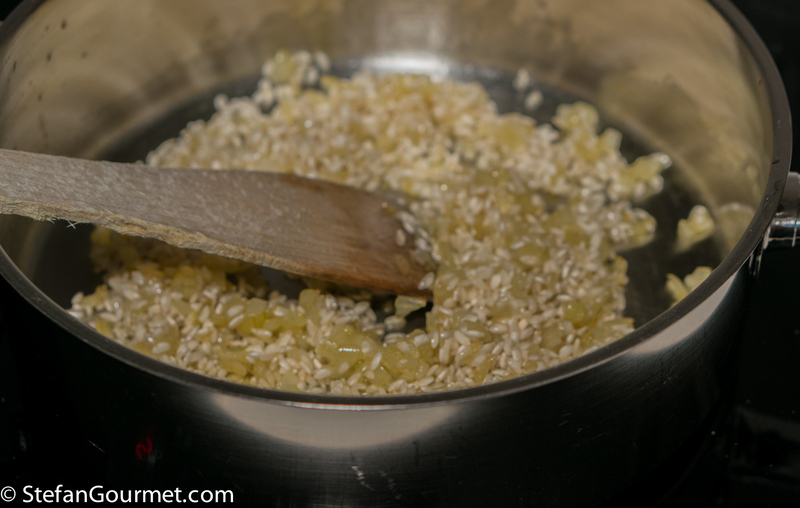 Toast the rice over medium heat until it is very hot and the edges become translucent, about 2 minutes. Add 60 ml (1/4 cup) of dry white wine. Stir over medium heat until the wine has evaporated. Add a ladle of hot vegetable stock. 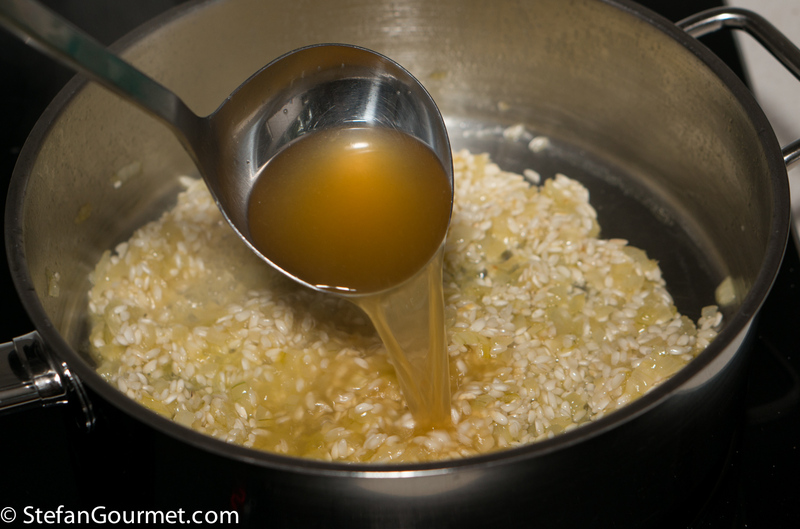 Stir until the stock has been absorbed by the rice. When that happens, add another ladle of stock and keep stirring. When the squash is cool enough to handle, scoop out the flesh with a spoon. Discard the skin. 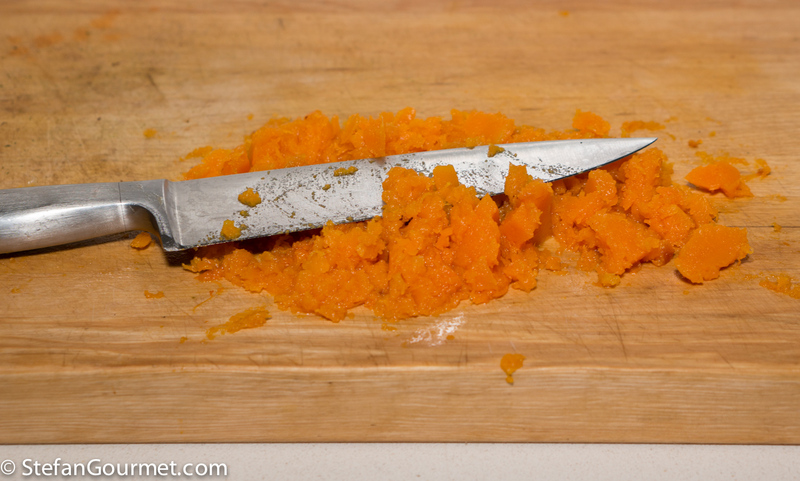 Mince the squash flesh to obtain a puree. 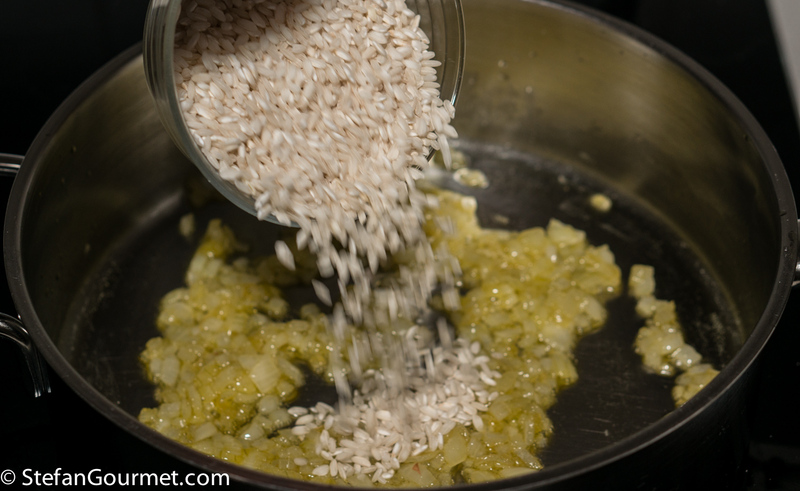 Stir the squash puree through the rice. 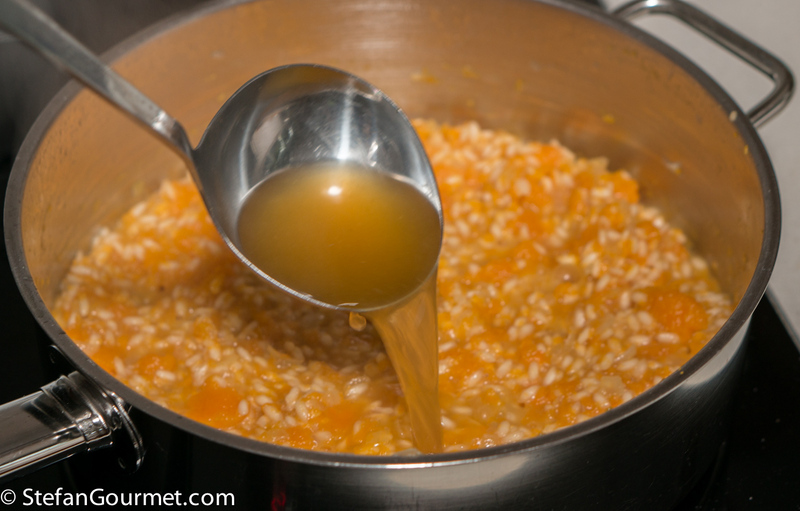 Keep adding stock and keep stirring until the rice is cooked al dente, about 16-18 minutes of total cooking time. Taste whether the rice is al dente: it should still have a nice bite to it, but not a tough kernel. 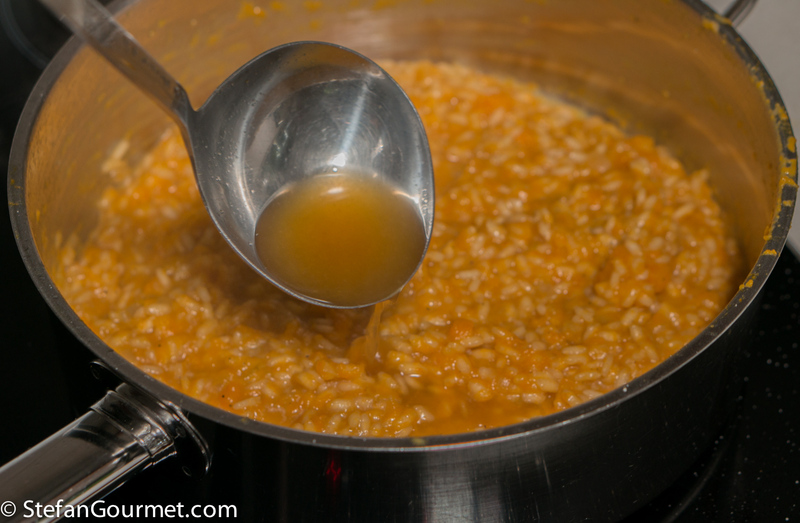 When the rice is cooked to your liking, turn off the heat and add a final ladle of hot vegetable stock. Add 30 grams of freshly grated parmigiano, as well as a tablespoon of butter, cut into small pieces. Stir to incorporate. Taste and adjust the seasoning with salt and freshly ground black pepper. 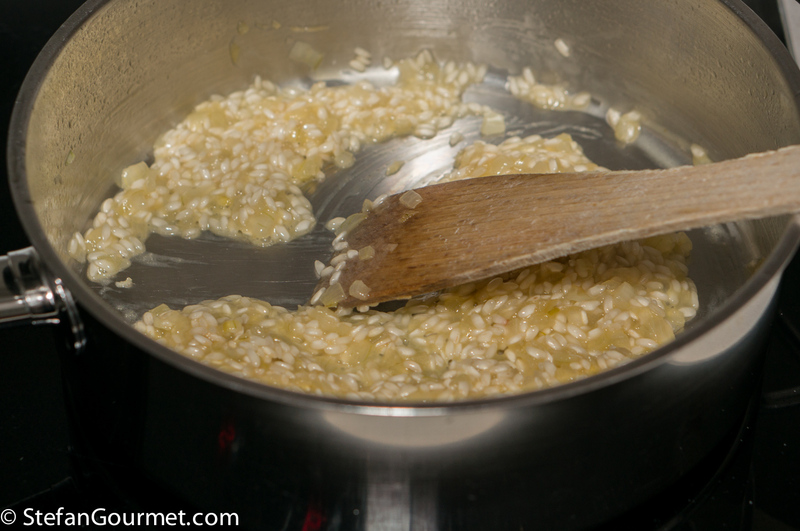 Allow the risotto to rest like this for a couple of minutes. 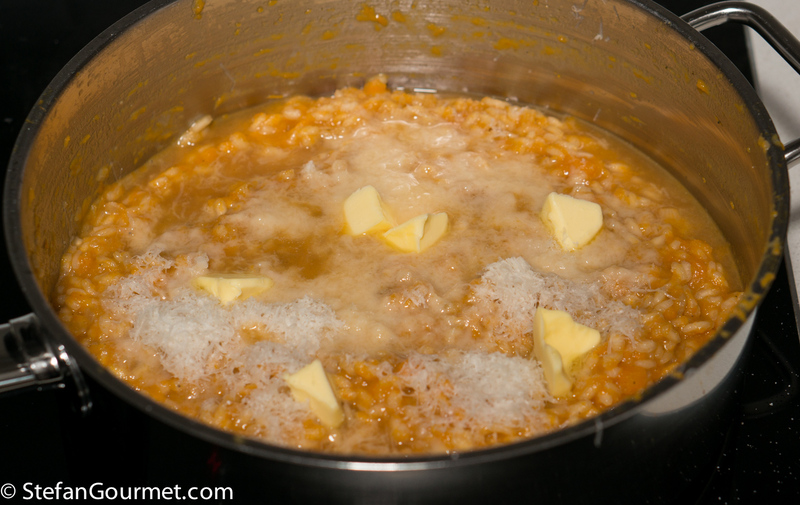 The final process of adding butter, parmigiano, and allowing the risotto to rest is called mantecare. 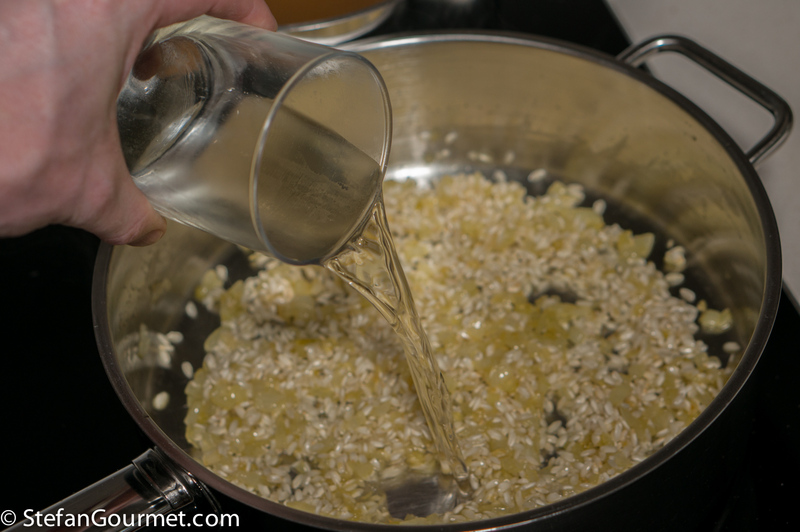 It will give the risotto its creamy texture. 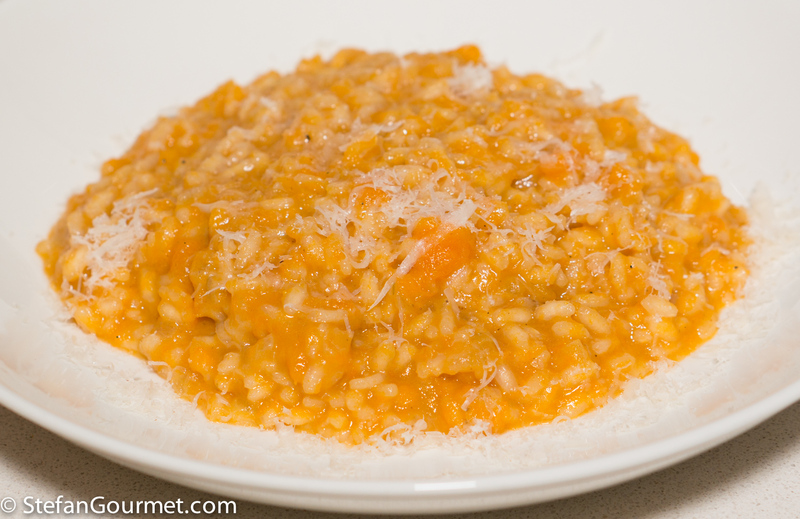 Serve the risotto on preheated plates, garnished with a bit more freshly grated parmigiano. Burrata is a fresh cheese from the Italian region of Puglia that is like a creamy version of mozzarella. 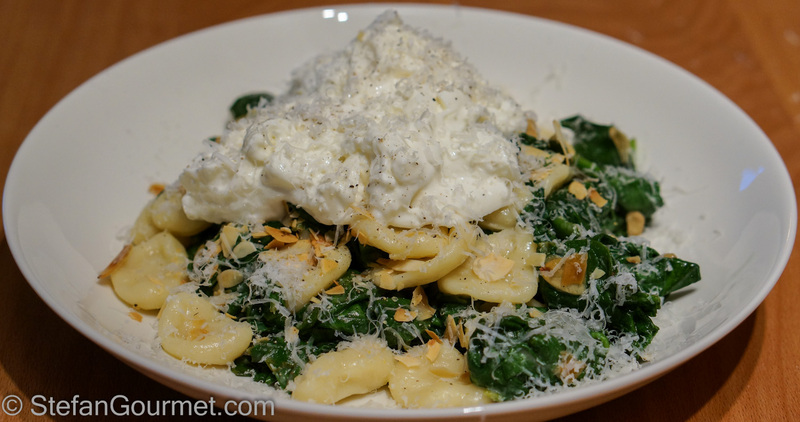 Orecchiette with spinach, burrata, lemon, and spinach is a great way to enjoy it. You are right it isn’t really the season, that is why it needed to be used up. They do seem to keep very well though. Ehi, ehi, questa è roba della mia terra! 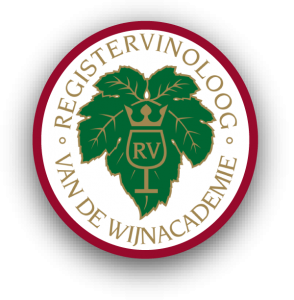 Complimenti, manca solo un po’ di rosmarino! La prossima volta aggiungerò il rosmarino. Grazie! One of my favourite risottos! OK: I can usually only get arborio and I do call the ‘squash’ a ‘pumpkin’ but what is that twixt friends 🙂 ! The ‘mantecare’ idea I have to adopt as the time factor sometimes does work to one’s detriment! Arborio is fine too, it is just slightly more difficult to get it exactly right than carnaroli, which has a larger “window” between undercooked and overcooked. 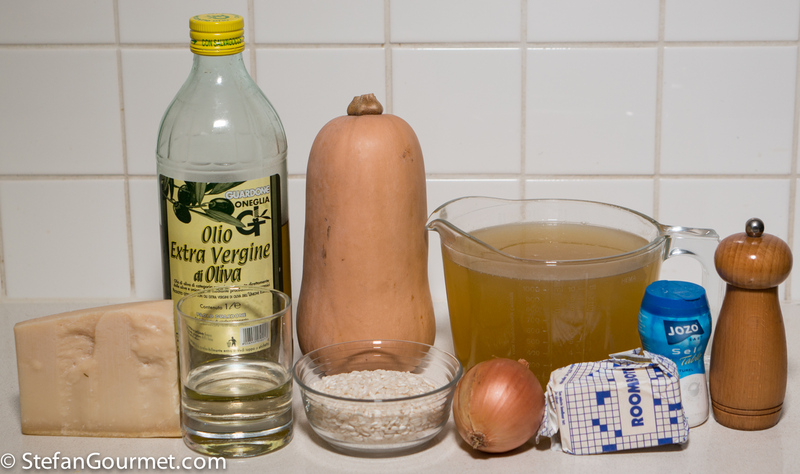 In Dutch, a butternut squash is called “bottle pumpkin”, and also in Italian both are called “zucca”. Decadent… And GF. We love roasting squash, yummy. Squash “fries,” too! 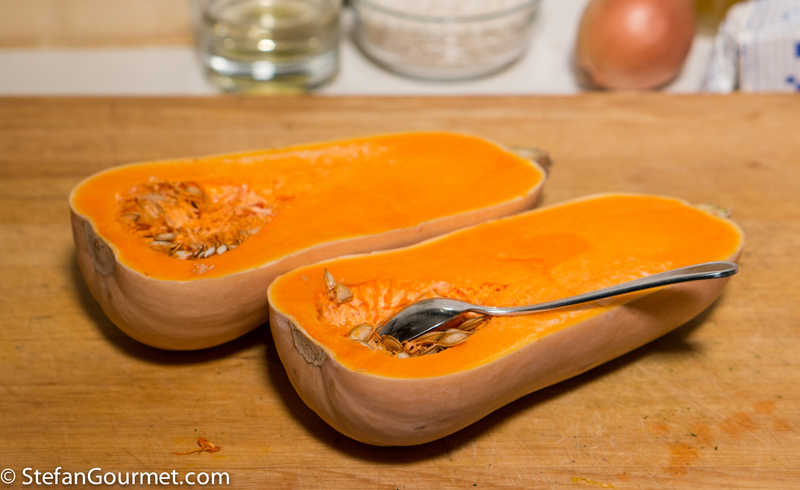 This is my go-to recipe for butternut squash, I make it whenever there’s one around! Often I first quickly fry some pork belly dices, remove, and slowly cook the onion in the pork’s fat. I add the meat back at the end before serving. 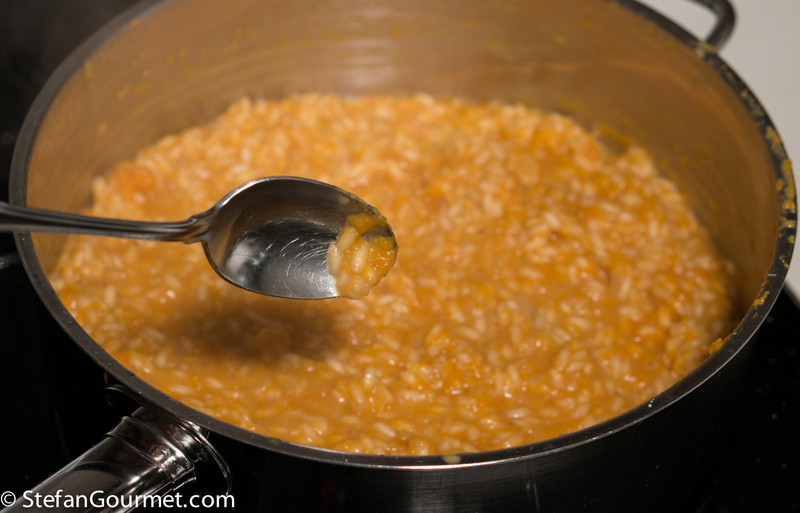 Most times I also cook risotto just in the pressure cooker rather than with the traditional method. Apart from being faster and hassle-free, I find the results also more consistent. Did you try that? Did you ever make a comparison of the results? Ciao Matteo, thanks for commenting. 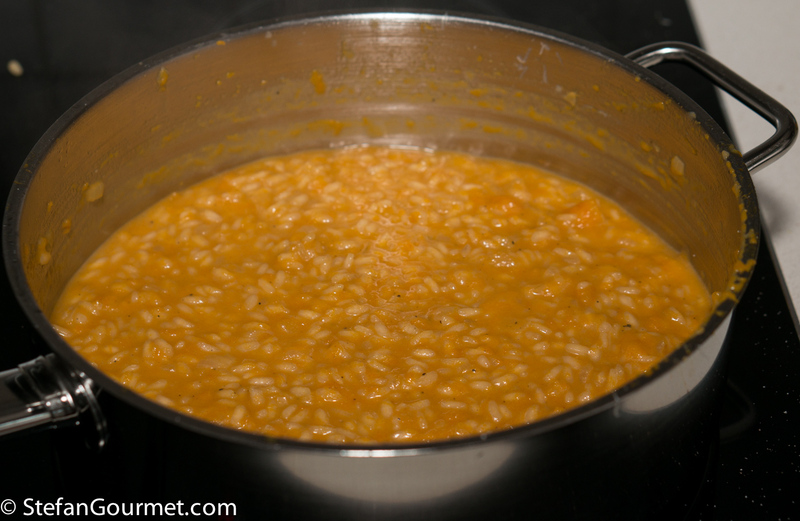 I have tried making risotto in the pressure cooker, but I have not tried a side-by-side comparison yet. 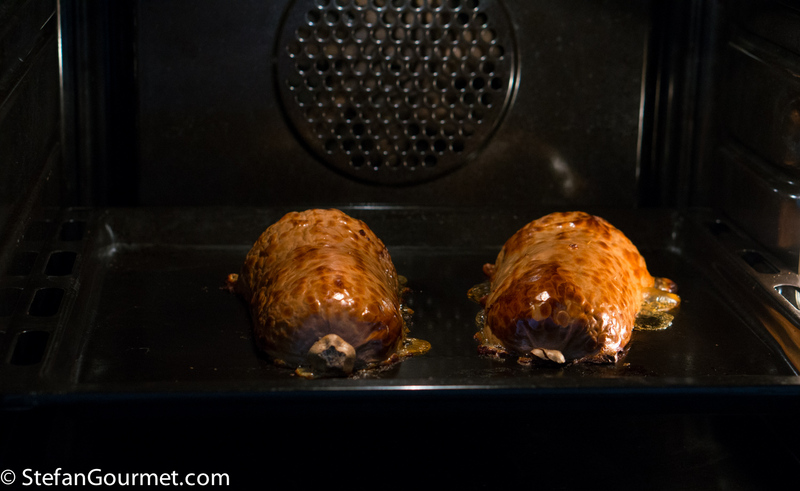 I have also tried it sous-vide and without stirring, but again no side-by-side yet. I keep making risotto the traditional way because I think I like the consistency better. To make sure, I would like to do a side-by-side comparison to figure this out once and for all. I like your addition of pancetta.